It would appear Hamilton County Commissioner and rouge Democrat Todd Portune is reportedly considering a run for Ohio Governor. Someone better explain to him that Ed Fitzgerald isn't going to drop out of the primary race just because Tim Burke asks him to make a deal. I would have no problem with Todd running, as long as he resigns from Commission and Cranley takes his place at the County. That would be a win for the City. Cranley is about like Portune, so it would just be a better City without Cranley and the Commission would stay the same. Then Portune would lose in the primary and leave politics. 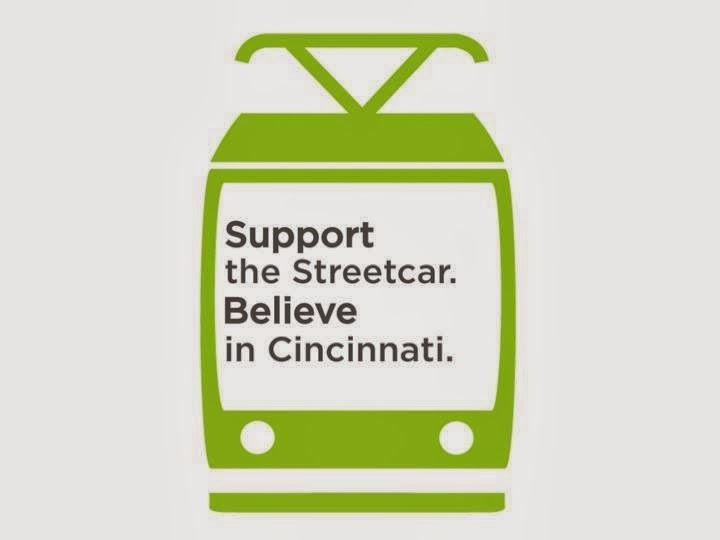 Last week Cincinnati Mayor John Cranley demanded a pony from Streetcar supporters. While a childish act, it wasn't the most childish Cranley could have been. After much hard work, by many people, Cranley was presented with a pony, it's name was SORTA. Then Cranley's childishness reached an all time high when he stamped his feet yesterday at a press conference and declared he wanted a BLUE pony. Acting like an ungrateful, selfish, and duplicitous child when he gets exactly what he asks for is not the type of leadership the city wants or needs. The 5-year-old antics just don't cut it in a mayor. Even Charlie Luken must admit that Cranley needs a time out for the disingenuous offer. Quimbob at Blogging Isn't Cool asked the question: Is John Cranley Even Lying to Himself? I think it is clear he is lying to someone. The question I have is: What is he NOT lying about? Does Cranley know who leaked the Duke lawsuit memo? Can he honestly answer that question? Or is better to ask Will he? What makes all of this relevant is that he has partially answered that question by publicly denying it was someone on his staff, but no one asked him that. Turnout rates grew by decade backwards to the 1930's with around 58% turnout for those born during the depression. People born in the 1950's, the Baby Boomers, made up 25% of the electorate, even though they make up only about 15% of registered voters. Irony: Far more people who were alive when Cincinnati was still paying off the Subway voted, than those not born after. Their ignorance is largely responsible for allowing Cranley and his Cabal damage our City. I thought wisdom was supposed to come with age? Few are surprised the Republican backed Mayor John Cranley led the effort to damage the Urban Core by stopping the Streetcar, but that doesn't lessen the blow to the Urban Core. It is both sad and disappointing to see the level that Cranley continues to see the Streetcar as a threat to his plan to Suburbanize the City. The odds that COAST's plan to pave over all of Downtown/OTR North of 2nd Street and create the world's biggest free parking lot for Bengals games has increased. The only question outstanding would then be how much would free parking reduce the number of battered women after Bengal losses. I don't see that as COAST priority. COAST, the Tea Party anti-City fringe group that endorsed John Cralney for Mayor, has nominated Cranley for a Conservative award. This speaks for itself to those paying attention, but for those not paying attention or maybe the few left in denial about who supported John Cranley is this mayor race let this show them the base that Cranley had to win the election. What will be most brazen would be Cranley actually appearing to accept the award. That would be a true insult to the City, the Democratic Party, and common decency. Cranley's not demonstrated an ounce of any of those thus far. Party ID listed about is based on the historical primary voting and third parties were combined with Parties that are "closer" to it's leanings. Third party numbers are not significant. That turnout becomes clearer by comparing his election in 2013, to the Joe Deters vs. Janaya Trotter race in 2012. Within the City, Trotter trounced Deters 65% to 34%, but of the 52 precincts Deters won in the city, Cranley won 51 of them. In the one precinct he didn't win, Cranley only lost by 14 votes. Cranley's win rested on being the "wink candidate" for the GOP, where they gave him as much private support possible, but not much public support to allow Cranley to placate enough of Dems and non-affiliated voters to win. With enough anger pent up on the Parking Plan, Cranley got his Conservative voting groups to all vote for him and lucked out with more Dems staying home on election day. It is clear that Cranley should never forget, or delude himself otherwise, that he won with GOP support. Without it, he would have lost. Chris Smitherman has an ethics issue and is not being honest about it. 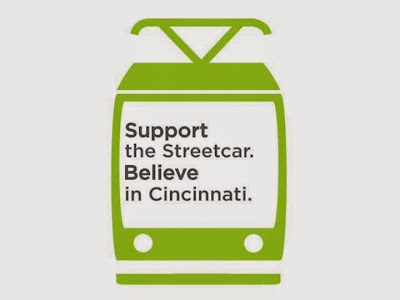 The Cincinnati Business Courier has reported that Smitherman's brother owns a company that has a contract to build part of the Streetcar project. Smitherman is claiming, without proof, that he's only known about this for a week and that his brother no longer has a contract. That connection is an ethics issue that Ohio Ethics Commission should investigate. Smitherman provided no proof the contract has been nullified or rescinded. That's part one of the deception. Part two is that Smitherman was not being truthful when he stated he knew nothing of his brother's contract prior to a week ago. Well, that is not true, and this 2009 NAACP press release provides evidence that he did know his brother was working on the Streetcar project. The Cincinnati NAACP has been briefed that Jostin Concrete has joined the Mayor's streetcar team. The owner of Jostin Concrete is the brother of Cincinnati NAACP President, Christopher Smitherman. Citizens will have the opportunity to witness the integrity and commitment of President Smitherman, the Cincinnati NAACP leadership and membership. Jostin Concrete may have a great opportunity, however, building a "choo-choo" train is the wrong public policy direction for the masses of Cincinnatians. Smitherman says, "I deeply respect the independence of my brother's company. I am confident that the issue will be rejected in November." So, this is the new chairman of the Law and Public Safety Committee lying to citizens of Cincinnati? If he is making false statements about this, how can anyone trust anything he is saying? He should not vote on the Streetcar until he obtains a favorable opinion from the Ohio Ethics Commission and Smitherman must provide proof of all of his claims. We don't need liars on City Council. Quimbob reports on John Cranley's legacy as a former member of City Council and what we see is financial mismanagement come home to roost. In a review of John Cranley's 170+ campaign tweets thus far the following breakdown of topics is very enlightening. And two, on March 10th, "I am proud to be a Democrat and that is why I filed as a Democrat for Mayor". So, other than the two on March 10th, Greg Hartmann or Brad Wenstrup could have tweeted all of these. Yes, in case you don't know, Hartmann and Wenstrup are Republicans. I don't know if the person who came up with term DINO (Democrat In Name Only) had some type of vision of the future where John Cranley would be running for Mayor of Cincinnati and claiming to be a Democrat, but a case could be made for that. Maybe Cranley hired a Republican to run his Twitter feed. I can't rule that out, but I would hope Cranley is running the feed himself. I'd hate for him to have sold out more than he already has. I doubt it, however. Voters need truth. We don't need Cranley (or Tea Party member Dusty Rhodes) pretending to be Dems when they do nothing, and I mean nothing, but carry on a Republican written and orchestrated campaign for Mayor. 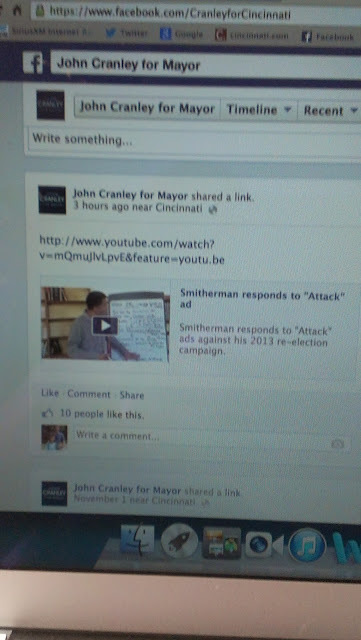 I am not shocking anyone when I call mayoral candidate John Cranley a liar. When I say John Cranley is lying about his budget 'plan' I think anyone knowledgeable about Cranley's shady city financial management past would be chiding me stating the obvious. There is nothing Structurally balanced about his budget and anyone saying there is lying. His plan takes money from other city budgets to plug holes, something that is not valid and got us into the trouble we are in now when he did the same thing when Charlie Luken was mayor. His plan uses money from the Casino that is uncertain, at best. Why not just use a rosy project that tax revenue will rise and call that structural? He takes already dedicated Parking revenue and yanks it from another city budget to plug a hole in another (The good Catholic boy knows how to Rob Peter to pay Paul). He then just cuts most everyone else by 10%. Well, not everyone. He doesn't touch the Police and Fire budgets. The biggest parts of the budget. Yep, that's a world class act of pandering. He also carries the tool of fear along and drives it through the West Side. He also doesn't say what gets cut in those departments with that 10 %. Is he just mimicking Charlie Winburn's salary cut plan? Does he want a 10% staff cut in everyone else? What other programs will he gut? Where's his courage to name what he would reduce? Is he willing to layoff other works but not cops or fire fighters because that means it would cost him votes? So, Cranley creates the most insane budget plan I've ever read (actually worse than Winburn's). No one in the media will likely question much about it, least not at the Enquirer. He and his surrogates will run around lying about this plan and few will call them out on their lies. Well, I'm here to ask you to call them out. Ask John Cranley why he is lying about his budget plan. Ask him to explain how his plan will not destroy the city. While you are at it, ask him to explain how his plan differs ideologically from the budget plan of the House Republicans? I mean they want to cut everything in the Federal budget, except for Defense. The comparison to Cranley is either eerie or intentional. Ask Cranley if he plans on getting the Republican endorsement? He so far is running the same campaign Brad Wenstrup ran 4 years ago. Brad was suburbanite Republican. Does that make Cranley a suburbanite Republican? I'm going to say yes, yes it does. John Cranley's political stunt carried out by his Republican supporters has COAST wrapped up with the anti-city lawsuit. COAST's bigot in chief, Chris Finney is representing the Cranley scheme. It would appear Smiterman's support for Cranley is landing the Westside native further and further into the political fringe. I thought Craney had limits, but when you hire Chris Finney, your walk to extremist gets a lot shorter. I think everyone, even fellow Democrats, would call Portune's call for cheaper parking in Downtown the bi-product of too many visits from Mary Jane. The problem is that the City has no funding to cut the current prices of parking and then increase the funding to maintain the expenses behind those parking spaces. The cities of Ohio are being punished for not support the GOP, mainly the governor, so their governments have had millions of State funded cut. Hamilton County owns the nearly biggest parking garage in the damn world, I don't see Portune making efforts to cut the prices to 1 dollar there. I don't know what Portune's angle is here. It is the most impractical thing to consider at this point. I'd like to give my family all a new car for Christmas this year, but unless the PowerBall comes through, it wouldn't be a good idea to send an email telling them it would be a good idea if I did that. I will at least give someone like Chris Seelbach credit for coming up with a plan that does not lease the parking spaces out and still has a theoretical way of balancing the budget. Portune seems to not like to live in the theoretical world of basic math. He wants some magic parking beans to make everything alright. In case you are wondering who John Cranley is focusing on getting to vote for him in the election, then look no further than his 'support' of the Republican effort to disrupt the city's ability to pass laws. It should be presumed that Cranley did more than just support this effort. It is likely he is behind it. I mean, if he wants to pretend he his Frances J. Underwood, he might not want to actually go to the court hearing after he orchestrates it to appear he isn't involved. BTW John, How much will this lawsuit cost the city? Somewhere along his educational path John Cranley, candidate for Cincinnati Mayor, must have just confused taxes with penalties for breaking the law. If not, he seems to want to let people break the law without being held accountable. That's not much of a law and order thing to do. In an Enquirer article about the parking deal, Cranley was quick to call enforcement of parking ordinances (aka LAWS) as a "tax increase." "Critics, however, say the numbers show the private operators will aggressively issue parking tickets to meet their revenue projections. “We’re talking about a massive increase in tickets for decades,” John Cranley, who is running for mayor, said Saturday. “It’s a 100 percent hidden tax increase on the citizens of Cincinnati.”"
Every time John pays his income takes, does he really think he violated the law? It is not a surprise John is talking like a Republican, where he plays word games with the truth. He'll have Westside Republicans thinking that it is their 'God' given right to park free where ever they want. It's 'free' to park at Walmart, after all. Those massive parking lots just grew out the ground naturally, waiting for a big box store to be built around it. Looking to fabricate false political issues to be the grandstanding champion of the hour, Cincinnati Council Member P.G. Sittenfeld sent out an email (pdf) yesterday with what must have been very short sided or just careless analysis. In his email he included a draft copy of the of Parking Plan Agreement between the City and the Port Authority. Sittenfeld is claiming that City Manager and other elected city officials were not honest when they stated that the parking meters will be free on Sundays under the new plan. Well, it is my opinion (based on the agreement) that the City Manager was being honest, and Sittenfeld is either creating a false news story to mislead the public or he really just didn't read the document very well, or yes, it could be both. Schedule 4 of the City agreement clearly states the hours and days of operation of Parking meters. Sundays are not included in the Period of Operation. There, that simple. So on the surface that seems good, and Sittenfeld is plain old wrong. Sittenfeld is playing a dishonest political game and is wasting his and our time with a sideshow. Instead he could go into more depth and find a problem. “Period of Operation” means, (i) with respect to each Metered Parking Space, the Days and the period or periods of time during each Day that the City permits the parking of a motor vehicle in that Metered Parking Space and requires the payment of a Metered Parking Fee for use of that Metered Parking Space as set forth on Schedule 4; and (ii) with respect to the Parking Facilities, the Days and period or periods of time during each Day that the City permits the parking of a motor vehicle in a Parking Garage or Parking Lot as set forth on Schedule 4. (ii) Increases in Period of Operation. Following the Initial Adjustment Date, the Port Authority may increase the Period of Operation for the Parking Spaces, provided, however, that the Port Authority shall not increase the hours of operation for the Metered Parking Spaces to any hour earlier than 7 a.m. or later than 9 p.m. without the unanimous approval of the Advisory Committee. “Initial Adjustment Date” means, with respect to each Parking Facility or Zone, the date on which all technology improvements have been made to the respective Parking Facility or Zone in accordance with Schedule 18. Smart parking meters must be installed at each Metered Parking Space in each Zone for the Initial Rate Adjustment Date to occur for that Zone. These smart parking meters must be battery powered, wireless, and offer coin and credit card acceptance. Smart parking meters do not need to be installed at Metered Parking Spaces where the City installed IPS meters approximately two years ago. Bottom line, in my humble layman's opinion, there is the strong possibility that the Port Authority could adjust the Period of Operation to include additional days, including Sundays, after the Initial Adjustment Date has been met. Therefore under the agreement, free Sunday street parking is not a permanent requirements if the Port Authority meets its upgrade obligations. If Sittenfeld or any other member of council wants to propose an adjustment to section 7.8a(ii) which defines how a period of operation can be changed, to exclude adding any Sunday Street Parking, then I would support that. This could be a real problem that might just be an oversight, instead of the confused mess Sittenfeld made of Schedule 9. “Identified Event Threshold” means not greater than five and one half percent (5.5%) of the aggregate number of Parking Spaces which would otherwise be operated during a Franchise Year but for an Identified Event. That is true. The problem is how Sittenfeld then went through a big calculation to determine what the threshold would be assuming that that "aggregate number of Parking Spaces which would otherwise be operated during a Franchise Year" to mean all possible spaces open all the time the whole year. He even misquotes the section by saying "all parking space hours in a year." Clearly Sittenfeld didn't want to mention Schedule 4 and how it defines what spaces can be operated and when, thus creating a differing number of parking hours, not including Sundays or other hours not open under the schedule. Sittenfield was all bent on the inclusion of Sundays and Holidays in the definition of an "Identified Event." Those should be included when talking about parking garages since under Schedule 4, since the Parking Garages are open on Sundays and Holidays. For Sittenfeld it is not clear enough, so via Twitter he advised me that the Port Authority is going to make changes to address the issue. If I were them a simple addition of " in the Parking Garages" on lines 18 and 19 of Schedule 9 should be enough to quell the perceived mighty Knights threatening the public. So when in his email Sittenfeld wrote "Sundays Would Not, In Fact, Be Free:" he was lying on two levels. First he was lying because under the contract Sundays are not days of Operation for Parking meters, they will be free (for now). Hell, even if someone tried to incorrectly invoke his false Identified Event Threshold theory, street parking would be free on Sundays, the city might lose revenue on the deal. Second is that even if the contract is too confusing and the lawyers need to tighten it up, there was no intent of deception on the part of the City or Port Authority. Sittenfeld used "can't keep a promise" as words to disparage the City Manager and those elected officials supporting the parking plan. That is the implication that they did this on purpose. No, they didn't. That's a lie. This type of argument is something I would have expected from a Smitherman or a Winburn or a Cranley. Sittenfeld doesn't want to be in their anti-progress camp. Go with the future, don't go with the politics of the past. The lawyers to tighten the language to quell the fears of Sittenfeld et al. Sittenfeld and the rest of City council needs to look at the section I pointed out above about how the period of operation can or should be change to exclude street parking on Sundays. Add a definition of what 'Holidays' are mean. I didn't find one mentioned. Saying all State and Federal holidays with some language about changes in the future should suffice. Then if there are other bigger issues that are not disputed as written, but for which anyone, especially those on council, disagree with, then debate those. If there are details not in the agreement that are key, it is valid to have that before voting on it. Stay away from paper tigers. Don't cherry pick topics, like parking free on Sundays, and try and get the public pissed at the City, especially under false pretenses. That is just the worst type of grandstanding and it is a soul killing political action.